And just a little bit of pixie dust! Today is the 65th anniversary of Disney’s Peter Pan. 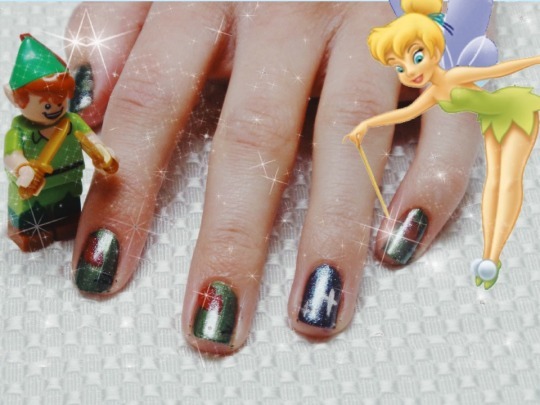 So we are celebrating with a Peter Pan inspired nail look. To give the idea of Peter’s hat, lay down a deep green on all your fingers. Alexia used Sally Hansen – Electric Emerald. Then use a fine nail brush and a shade of red to pop in a bright feather. Alexia went with the classic of Revlon – Revlon Red. Using a Sally Hansen black nail art pen to make little bend marks at the side of her nails, to give the hat a little crease movement. Place a base color down representing the night sky. Alexia’s pick for this was H&M – Intergalactic. Again using your nail art brush, add two white stars, one slightly higher and to the side. After all, it is the second star to the right! Give your nails a little bit of pixie dust with a sparkle coat like Essie LuxEffects in Pure Pearlfection. Finish up with a high shine top coat. Are you doing anything to celebrate that boy who “won’t grow up”?